Have you ever look out a rain covered window and wished you could be out there with your drone? Most of our favorite quadcopters would not do well to get wet, but there are some that can handle it. We’re not just talking about a bit of rain, there are a handful of drones that are happy to go for a swim! Join us for a quick look at a few flying machines that can handle a dip in the ocean, these are some of the best waterproof drones. For the most part, our drones today will be almost completely waterproof, but please look into the finer details to make sure that they will meet your needs. That is, you can get splash-proof drones that can handle a light rain, waterproof drones that are not safe in saltwater or fully submersible ocean vessels. Further, just because a drone is waterproof, does not mean you can land and take off from water. To do so, a drone must float or otherwise get the propellers out of the water far enough to push enough air for liftoff. 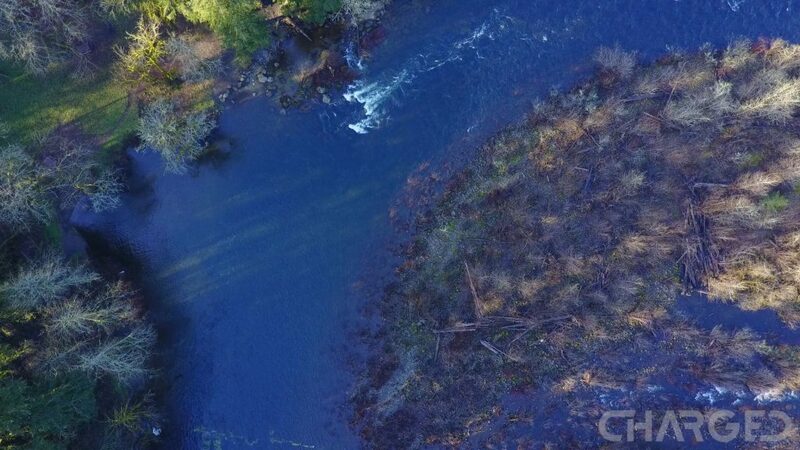 Breaking the surface tension of the water requires a lot of power as well, most drones will not have an issue with that, but it is certainly something to be aware of when shopping. Before we get to the list, there are waterproofing measure you can take on nearly any drone. We will not be covering these options, nor promoting them, but a little research on products like Corrosion X may solve your needs. 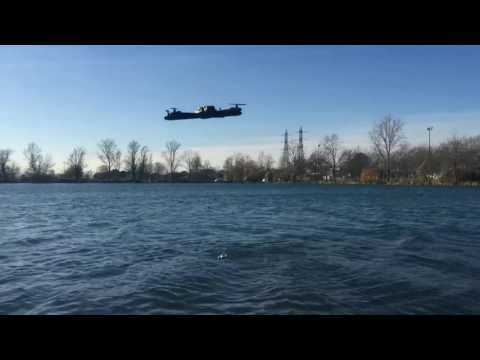 If in doubt, hit your local hobby store that handles RC boats – the electronics in your drone are likely similar to that of an RC boat, if they can go in the water, so can your drone. We’ve also seen some DIY projects that affix flotation devices to the landing gear of popular drones, we do not recommend this either. Again, not saying you can’t do it, just be wary of that surface tension and extra weight of the water – the failed DIY attempts we’ve seen all either could not lift off, or flipped into the water when a side or corner failed to lift out evenly. That $4 pool noodle sounds like an inexpensive experiment, please don’t let it sink your thousand dollar drone. Last word on the matter, please do keep in mind the additional power requirements to fly in inclement weather. The impact of water drops on your propellers can be detrimental at its worst. There is a fair amount of extra weight from water on the drone, never mind the risk of water trapped inside the drone. Finally, if flying in the rain, there is a good chance it’s windy out as well. Fighting wind is one of the fastest ways to kill a drone battery. Fly safe. Changed your mind about waterproof drones? Winner of our award for best submersible drone at CES 2019, the Swellpro Spry is a fairly compact quadcopter that is entirely waterproof. It is made for the sky, not to soar under the waves, but the drone and the remote are both comfortable going for a swim. A maximum speed of 65KM should be able to keep up with your surfing adventures, and that heavy waterproof body limits your airtime to about 15 minutes, but don’t forget that the drone floats. When sitting on top of the water, the camera is submerged, allowing you to record video from the perspective of a snorkeler for far longer than 15 minutes. The Swellpro Spry will ship to consumers soon with a starting price of $898. 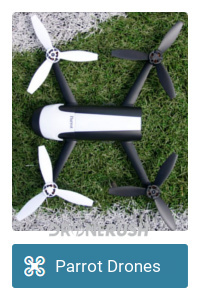 We’ve seen the Parrot Hydrofoil MiniDrone before, just a brief appearance on our Parrot drones guide. 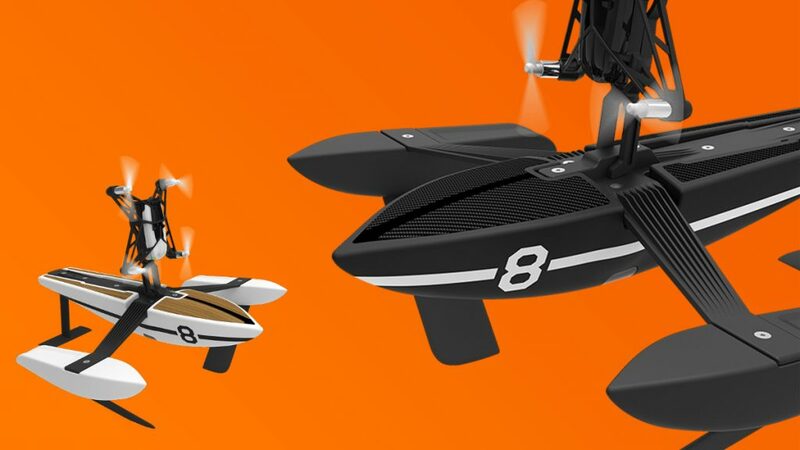 Once again, we’re not looking at a very impressive flying machine here, but as a concept and RC boat, we have nothing but applause for Parrot. We must admit a little disappointment when we learned that the little quadcopter on the Hydrofoil could not lift the entire assembly out of the water. However, once detached, the MiniDrone portion of this unit is a fairly capable flier, and while not fully waterproof, it can certainly handle some fresh water splashing. 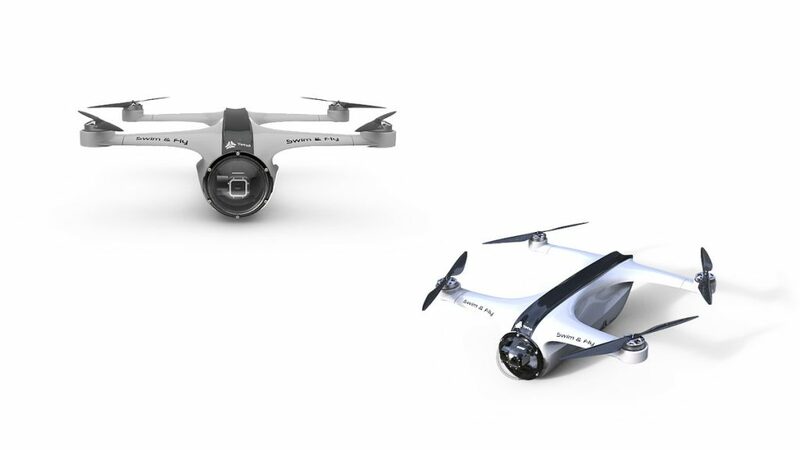 Check out the Parrot Hydrofoil MiniDrone for $49 on Amazon today. Unleashed through Kickstarter back in 2015, the Swellpro Splash Drone is an enthusiast built quadcopter with complete waterproofing in mind. 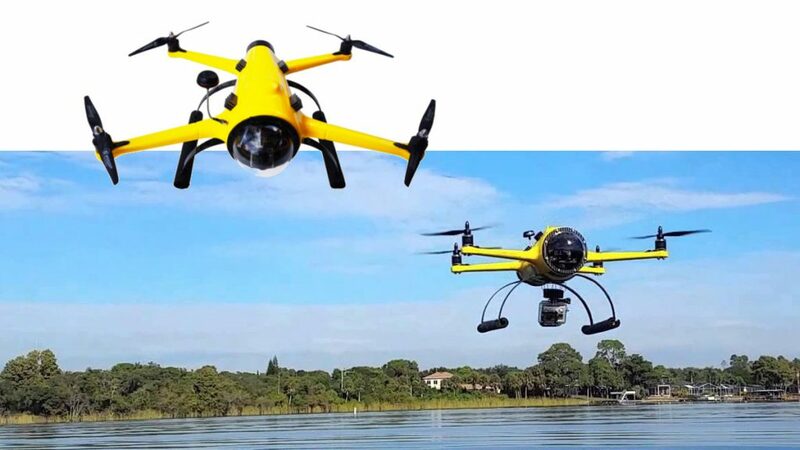 The latest version of this submersible drone comes in two flavors, the Auto, with a nicely equipped 4K camera, and the Fishing Drone with a payload release system. As much as I like the idea behind dropping cargo, please brush up on your FAA rules in the U.S. before you do so. 16 minutes of airtime will keep you entertained while flying over, or dunking under the water. Also, you’re good to fly in the rain as well, a bonus. 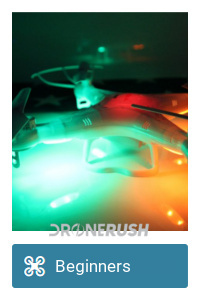 Check out the Splash Drone 3 from $1,199 for just the drone, you’ll have to tack on the camera and other bits needed to fly from there, expect to spend about $2000 for a well-rounded package. We’ve teamed up with Swellpro to get you a discount, click those links and enter coupon code: AFFILIATE-6884-FV6T2-ILMF for some savings on your purchase. 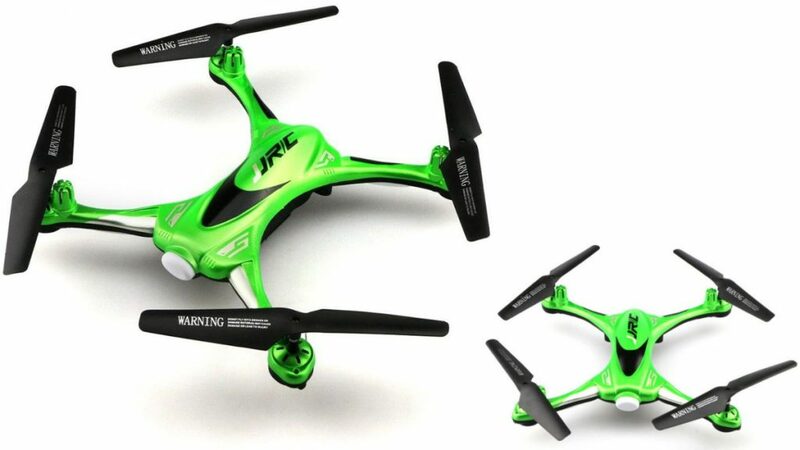 Another in the line of small, toy-class drones, the JJRC H31 offers up headless mode, the ability to flip and more. Of course, the reason we’re here, it is also waterproof. That said, we feel as though this one takes liberties with the term. It is certainly splash-proof, and can handle a short accidental dip, but I would hesitate to fully submerse this drone. Luckily, if anything goes wrong, you will be more frustrated than broke – check out the JJRC H31 for $35 on Amazon today. This is probably the most expansive drone on our list, but there is much to like about the QuadH2O waterproof drone. In terms of capabilities, the fact that it looks like a flying submarine is for good reason. No, sorry, it’s not a submarine itself, but it could be if you could figure out the propulsion and ballast systems. Built-in FPV camera, action camera mount, fully floating design, 1000 m range and upwards of 10 minutes of flight on a charge are fairly mediocre specifications. The passionate team behind the product and fully waterproof build add up to a $2895 ready-to-fly price tag for the Quad H2O. Now you’re looking at a starter kit for $849.00. From the makers of the QuadH2O above, the new HexH2O Pro V2 is a folding hexacopter design, utilizing many DJI components, including their Zenmuse X3 camera and Lightbridge radios and controller, you can even fly the HexH2O using the DJI Go app. Packing this powerful 4K camera into a waterproof housing that sits below the surface of the water, you can land on the waves to see below, or take off to enjoy DJI Inspire level aerial photography. This is an impressive professional drone with the added bonus of being weather resistant and able to land on water. I hope that prepared you for the next part, the price. 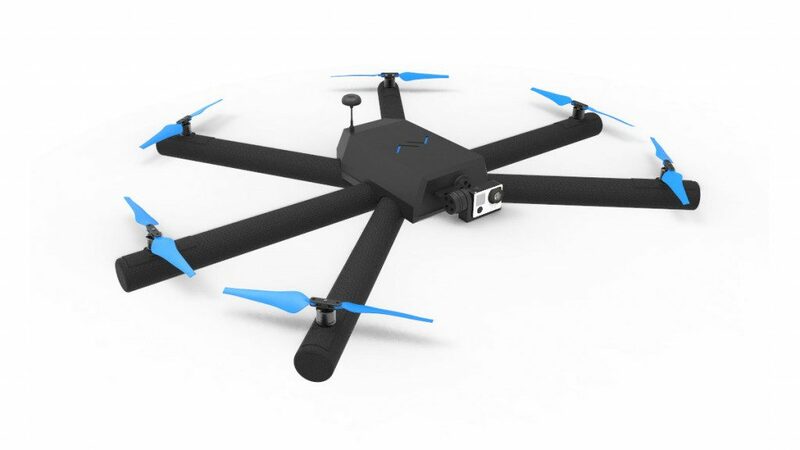 The HexH2O Pro V2 starts at $1995.00 for the base drone, however, you’ll need to add bits and pieces before you can fly, a fully loaded purchase, including the Zenmuse camera, remote control, flight controller, a tablet for the remote, a case, ND filters and a microSD card is $8590.90. You should expect to pay about $5400 to get the HexH2O Pro V2 off the ground. We teased a submersible drone, let’s go all in with the PowerVision Technology Group PowerRay, a submarine with a camera. 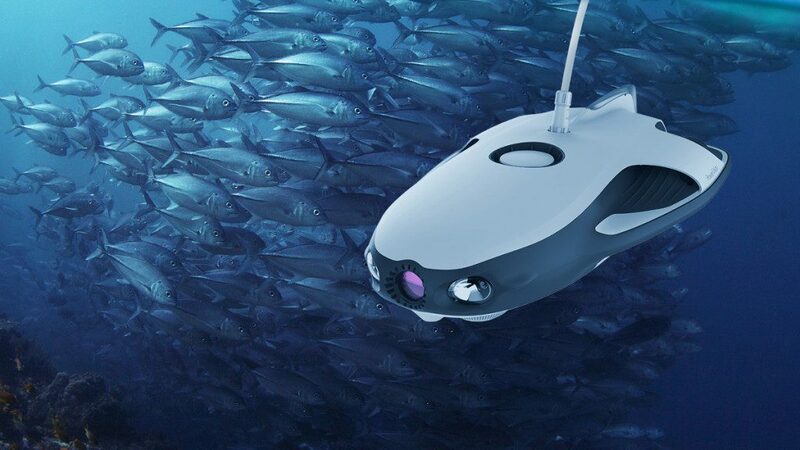 Designed for any type of water, the tethered craft has a fifty meter cable, 4K camera and an FPV headset to live view what you are recording under the sea. PowerRay may not be the most capable underwater drone on the market, but it’s the one that’s on our radar. You’ll need to sink at least $1,092 to swim with the fishes. 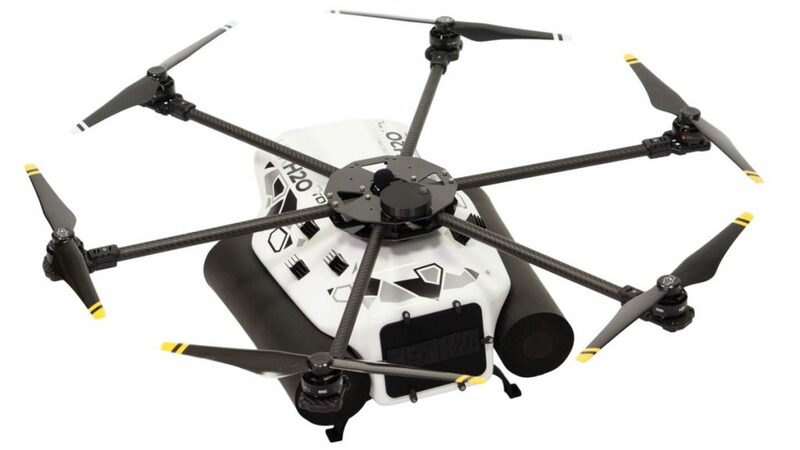 A British installment to our list, Tetra Drones builds the Tetra Drone. This is a fully submersible flying machine that tilts its propellers forward to move through water, then back up to take tot he sky. What we’ve seen of the machine looks like it supports a GoPro, or similar small camera, stabilizing it behind a glass bubble. We’d love to see more on this drone, but as far as we can tell, it’s a solid offering for a waterproof drone. It would be wrong of me to suggest you purchase this drone without some research, we simply encountered it in our travels and thought you might like the idea. In short, the smarts of the craft are tucked into a 3D printed waterproof housing, then inflating tubes act as propeller arms. The bottom is flat, ready for water landings. Enjoy the video, and do please let us know if you pursue this one, we’d be curious to know what you find and how it works out for you. Learn more here. Most of us will never intentionally go for a swim with our expensive quadcopters, but for those that would like to do so, we hope these waterproof drones will fill your need. That said, every time I fly my DJI Mavic Pro over top of water I am thinking about that worst case scenario, maybe I should invest in something that floats as well. Is there a waterproof drone you prefer, or do you keep your flights to sunny days?